When I tell someone minimalist fashion Project 333 will change their life, and they say, “I could never dress with only 33 items” who is right? When I tell someone they will learn so much about which foods are best for their body if they challenge themselves to The Whole 30, and they say, “I can’t live without sugar in my coffee” which statement is true? I believe what I’m saying, and they believe what they are saying, but neither one of us has enough information to claim the absolute truth. How will you know the truth if you believe everything you think? Things changed dramatically when I stopped believing everything I thought. Instead of listening to the fear inside that told me I couldn’t do it and encouraged me to stay safe and comfortable, I chose to experiment and learn what was really true, and what was best for me. I lived with only 100 items for a few months. 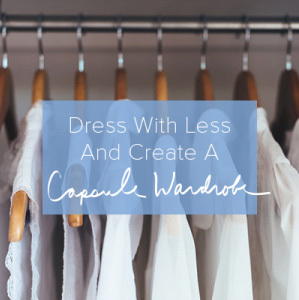 I dress with 33 items or less every three months. I traveled for a month with only a carry on bag. I abstained from sugar, grains, dairy, alcohol, and processed food for 30 days and I’m doing it again this month. The value of these personal experiments and challenges is I’ve had an opportunity to experience the truth instead of assuming it. Whenever I think … “I could never” or “that’s crazy” I know I need more information, and that I’ve identified an area to grow and change. 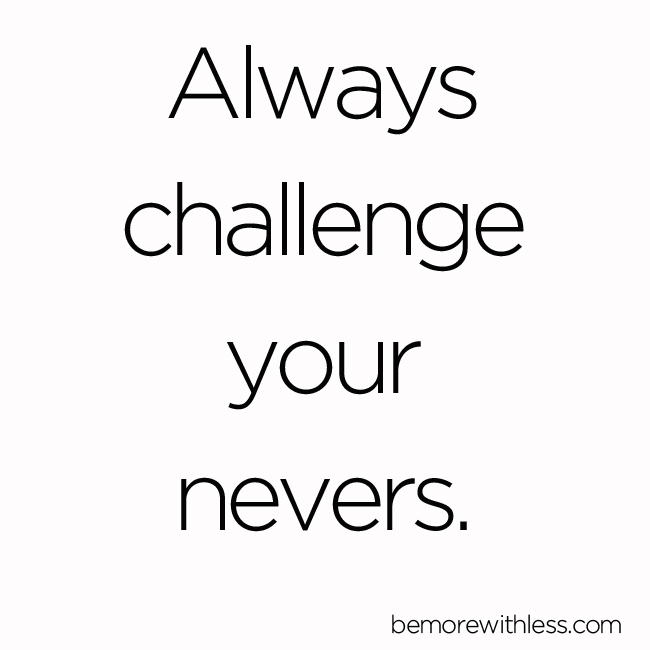 I always challenge my nevers. Whenever you say “never”, pay attention to your never statement. Never can discount possibility, change, growth and ultimate happiness. Never robs us of better health, work, love and happiness. Never keeps us comfortable and complacent. I could never be debt free. I could never quit my job. I will never give up meat/sugar/bread/insert favorite food. I will never leave this town. I could never give up ___________________. I will never try ______________________. I will never change ________________ . We deserve to challenge our nevers. When we make decisions based on facts instead of fear, we can change anything we want. Only pack for 1/2 the days you are traveling. Post only positive comments and ideas on social media for a month. Stop complaining for 21 days. Give up Facebook for 90 days. Give away one thing a day for a whole year. Write 100 thank you notes. Only check email once a day, or once a week. If you want to challenge your nevers around stuff and learn how to identify what “enough” means to you, try Project 333. 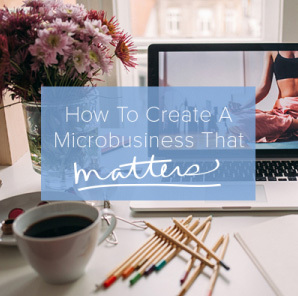 Everything you need to know to get started is right here. When we challenge our nevers and engage in personal challenges and experiments, we discover what we want most, learn how we can contribute better, and live magnificent lives. 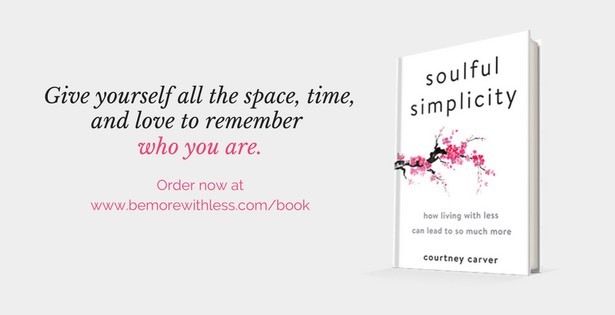 This is very true, Courtney. You never know until you try! Stop complaining for 21 days – my favorite challenge. The word never has a very negative connotation. It stops us from reaching our full potential. Whenever you say never you are saying no to happiness. I do not know about those challenges though. Great post. Mindset plays a major part in our lives and by changing it a little bit at the time you can make a lasting change. There are many areas in my life I need to overcome and I am working on these daily. Oof– stop complaining for 21 days– you got me! I don’t think I complain excessively, but ceasing altogether is an excellent challenge. This is a very useful post – thanks! I have also really benefited from personal challenges, such as 30 days of no alcohol and writing in a gratitude journal for a month. I love how this article takes the idea of challenges a step further by asking us to challenge our ‘nevers’.. a great reminder to take into the year ahead. A great article. Many thanks. And I’m looking forward to looking at the links to the challenges you’ve given. There’s several I really like the sound of. I’m currently challenging my “I could never give up sugar” belief. All the very best with yours. I think if more people were a little more open minded we could see more changes for the better. Many people fear change, and because of that it’s hard to open your mind to other alternatives. I also see too much of the concept that if you are right, then that means I must be wrong… and I’m never wrong. I prefer to be open minded to many different possibilities and to test ideas with my own experiments. I tried one of the ones you mention here, pack for half the days you are traveling. I did this on a 10 day trip in our camper. About half way through the trip I did laundry. It was super easy and it made packing so much easier. Plus there was less laundry to do when we got home. “How will you know the truth if you believe everything you think?” WOW! I know what we will be talking about at the dinner table tonight :o) Thanks for such a thought-provoking post!! So love the way you describe experimenting. We did a 30 day food challenge in November that seriously challenged our ‘Nevers’ and we thought would have us running off a cliff… we enjoyed discovering we still had some willpower (long-though lost with trace) and the results than here we are in January having signed up for our 3rd bash of 30 days. It’s changed how we’ll eat for all time. No more nevers, ever. Great post. I’m a big believer in challenging myself. I also find that I’m naturally drawn to people that are similar in that regard. It’s great when you can have an actual conversation, not debate, with people about WHY they think the way they do. It can be a liberating experience. I really like the message in this! I am challenging a small-ish never: “I could never leave my phone in the kitchen all night.” Well, I set up a good old fashioned clock with an alarm, and haven’t had my phone in the bedroom for a few days. I really like it so far…sitting with that little bit of discomfort is a good thing. Wow, this was inspiring!! I agree with everything you wrote, but for some reason it has been always easy for me to “forget” about this in my everyday life and just rely on my habits thinking that, yes, it was alright to keep staying in my comfort zone. But this year I want to try a different approach. As a good start for the new year, I completed last month the 30-day minimalism challenge (that I found on into-mind.com) and only then I realized how much I complain, and how hard it is for me to complain less and just be grateful for what I have. So one of my biggest “nevers” at the moment for me would be this: stop complaining for 21 days. Thanks for sharing this, it is a great read! I fully agree, Courtney! Without exploring our true potential, it’s impossible to know what we’re truly capable of doing. Also, it just gets easier and easier to challenge yourself and try new things after you do it a few times. The biggest resistance you have is in the beginning, because you’re doing something you’re not accustomed to doing. What is fascinating once you embark on a change is that once you give a new habit, idea, concept a chance, more than not you will dig deeper. I remember thinking as I searched for more wiggle room in my budget- but I have thought of everything! Then as I explored more, I found another $10 of savings for my cell phone bill, learned the pleasure of using my community’s clubhouse for free Wi-Fi service, almost entirely stopped using my clothes dryer, etc. But that is only one tiny aspect of life. How many other delightful treasures for relationships, health, food can this apply to? What a great mantra! I used to rebut any “I can’t” statement from friends and family (much to their chagrin, I’m sure). There was a point in my life where I was immersed in self-discovery and experimentation with a myriad of lifestyle choices. “Can’t” and “never” were not part of my vocabulary. Now, I find myself settling for current situations rather than “challenging my nevers” to learn and grow. Thanks for the reminder of what we’re all capable of doing! Wow!! This is really great..a challenge to the nevers…a very creative way of looking at things… brand new ideas…might just try these…YES! YES! YES!